At Carnegie Mellon University (CMU), the semester course drop date is 10-weeks into the semester, which is abnormally late compared to those of peer institutions. There has been much discourse over the past year about moving up CMU's drop deadline to two weeks into the semester. Students and faculty often have strong and varied opinions on this proposed change. 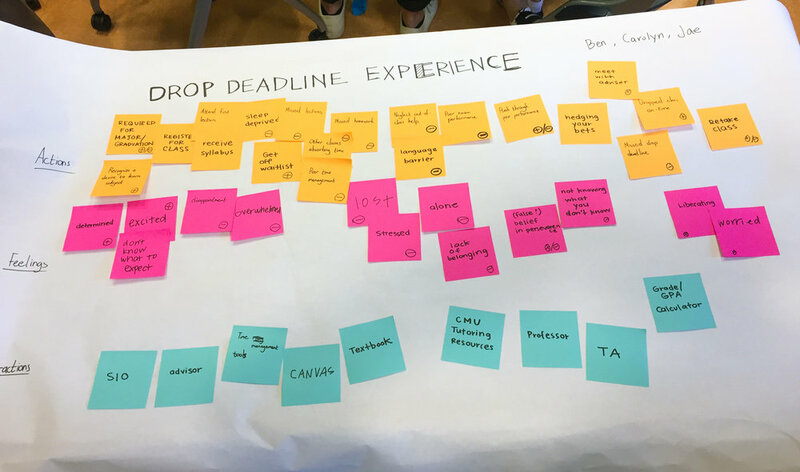 We are interested in investigating the extent to which the drop deadline affects students, professors, and other members of the CMU community, and how a design intervention can mediate these contrasting perspectives. In our territory map, we identified the key groups directly involved in this problem space, and the internal and external influences/motivations that may affect their perspective on the issue. In our stakeholder map, we showed all the core, connected, and indirect stakeholders affected by the course drop deadline. This helped us consider the bigger picture and the range of people who may need to be consulted during our research process. We put ourselves into the shoes of a user (student dropping a course late into the semester) and described the actions, feelings, and interactions involved in their journey. A survey was distributed on FB and other social media to learn about the student experiences and perspective on the course drop deadline. 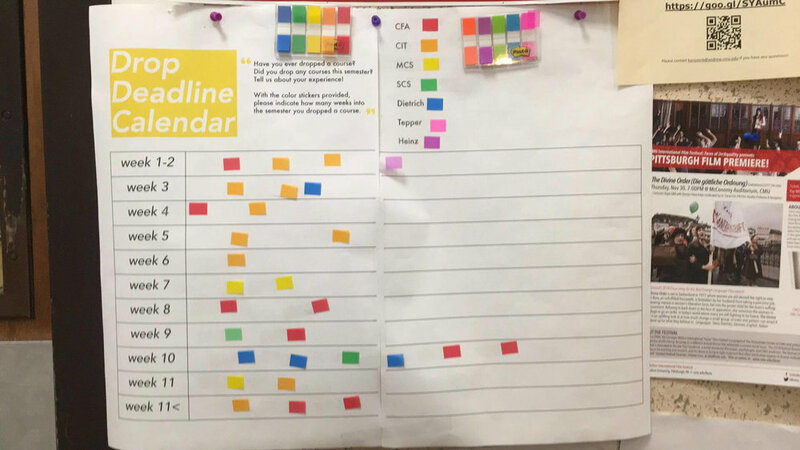 Participants were asked to place a colored sticker (color corresponding to their department) on the week they have dropped a course. Although we did not find any significant relationship between department and course drop week, this gave us an understanding of when the course drop deadline is most relevant to students in general. We talked to teachers and advisors across a wide range of schools at CMU. From our discussions, there seems to be a lack of communication and strong relationships between most students and faculty members. This contributes to the problem since students are not getting advised as well and teachers do not trust student's instincts.